With Northern Lights Restore cover cleaner, restoring your hot tub cover`s original color is easy. Just spray, wipe, rinse, and cover fading and dirt is gone! "Approved for all types of Spas and Hot Tubs including Wood"
Northern Lights Restore is specially formulated to work with all hot tub and spa covers. 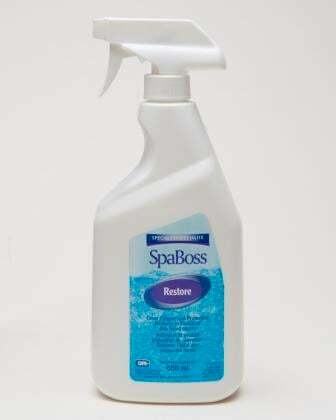 It`s special blend of cleaners and conditioners leaves you cover looking brand new! Apply to cover and gently scrub using a light scrub brush or damp towel. The amount of cleaner and scrubbing will depend on how dirty a cover is. Rinse cleaner with water and you will notice the dirt is gone and your cover`s color has been restored. Use regularly to maintain your cover`s original condition. UV inhibitors in Restore`s formula protects against sun damage and fading. WE SHIP WORLD WIDE! Contact Us for an estimate!